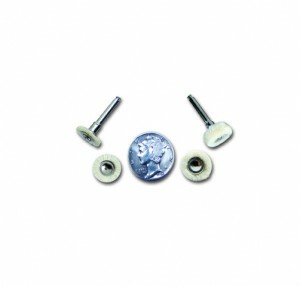 Home/Archive by Category "Operatory Products"
DVA’s Ceramo-Dot adjustment kits are designed for the dental laboratory. They allow the dental lab to not only thank their accounts for their patronage, but provide a kit that allows them to safely re-smooth and re-polish restorative restorations. Ceramo-Dotz is an outstanding product for the fast, simple polishing of ceramic restorations to a high-luster in seconds. The one-time use Ceramo-Dotz is an easy to use discardable system, which greatly simplifies the prevention of cross-contamination. 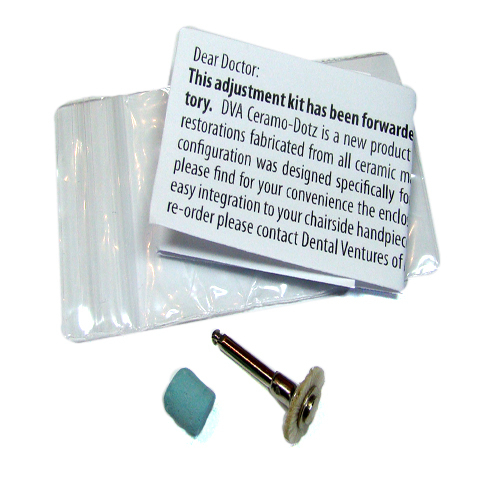 DVA’s current customers are simply distributing one kit with each case departing the laboratory. The DVA Mini Bristle Brushes and Mini Cotton Buffs are two extremely unique polishing instruments which are ideal for the intra-oral polishing of ceramic or composite restorations. This unique family of useful rotating instruments includes Mini Bristle Brushes and Mini Cotton Buffs. Both are 7/16” (1 cm.) in diameter with a latch type contra-angle shank. The total diameter of each wheel is approximately half the diameter of a dime! The Mini Bristle Brush is designed for polishing all types of ceramic restorations and the Mini Cotton Buff is designed for polishing all types of composite restorations. 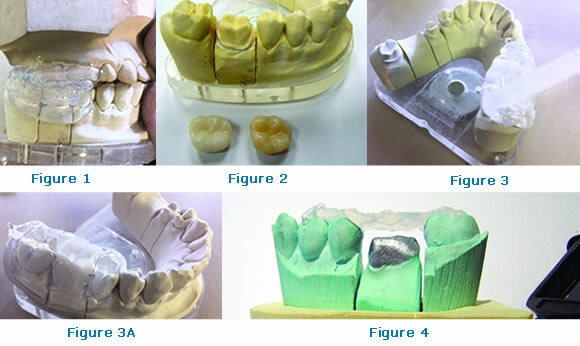 However, with the appropriate polishing medium, both wheels provide an outstanding finish to most dental materials; such as metal, acrylic resins, acetal resin, lithium disilicate, lucite-based ceramic and thermoplastic materials. DVA’s Mini Brushes and Buffs are available in either packages of 100 pieces or a combination package containing 50 Mini Bristle Brushes and 50 Mini Cotton Buffs. Acryl-Marvel, a new polish for simplifying the finishing and re-polishing of dentures that required some final adjustment. The special compound is supplied in small individual shapes designed for use with only one patient. Cross-contamination prevention procedures are thereby significantly reduced. 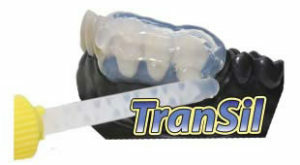 The polish eliminates the scratches and trimming markings and high-shines the denture in one, continuous operation. No pumice is necessary. The resultant hi-shined, polished surface is extremely silky and lustrous; extremely resistant to the build-up of calculus.